Objectives and presentation of active teaching and activity based learning. What Is The Conventional Method Of Learning? Conventional method of learning is the common method that schools and colleges use. It is a classroom set up where the teacher teaches on a blackboard and students listen to it seated on chairs inside a class. Activity-based learning is indulging students in activities by stimulating their senses, such as sight, smell, vision or feeling, and getting them involved in the subject. The activity-based teaching method is applied in the USA schools. It is a learner-based learning method. We make our efforts to apply it in our schools. The general objective is to create a generation of learners that are able to adapt themselves to the environment around them perfectly and practically. It ties knowledge with environment. It encourages thinking, independent learning, solving problems, observation, dialoguing with one's self, dialoguing with others, guessing, applicability, imagination, creation and innovation. Objectives are built around good verbs. I like to think of verbs as the gasoline that keeps a lesson moving forward. Thus, the verbs you use in your lesson objectives should be action verbs or verbs you can use to measure performance. Passive verbs are often immeasurable and make an objective weak. To take the analogy one step further, objectives are what drive a lesson. They power it forward. Objectives are built around good verbs. I like to think of verbs as the gasoline that keeps a lesson moving forward. Thus, the verbs you use in your lesson objectives should be action verbs or verbs you can use to measure performance. Passive verbs are often immeasurable and make an objective weak. Action verbs in your objectives help you assess students and be sure they know or can do what you taught them. These are just a few sample verbs (among hundreds possible). The traditional method of teaching is practiced in the third world countries. It depends on collecting or attaining a lot of information to deal with theoretically and to learn them by heart so that the learner can register these pieces of information in the written answering paper in the final exam that depends only on the writing skill. It ignores the skills of listening, speaking and communication. The traditional method is close to the GTM (Grammar Translation Method ) which depends on just translating the text and presenting the grammar structure in the deductive way without presenting any model by the teacher or free practice by the learners. There is no place for any communication, practical learning or any activity. That traditional method is not recommended at all. separate parts, however, because they accomplish different purposes. It provides interest and motivation to the students. It focuses students' attention on the lesson and its purposes. 2-Showing pictures that relate to the lesson topic. 3-Telling a story to show the importance of the topic. 4-Bringing in "realia" (real objects) related to the lesson. during the practice phase of the lesson. 1-Changing the abstract and theoretical teaching into something touched, deeply rooted in the learner's mind, feelings and behavior, practical, actual and real. 2-The piece of information is functioned and implemented in a real teaching situations. The teacher uses drawings, pictures, signals, pointing, gestures, motion and circulation. The learner plays the role and dramatizes his learning. 3- Giving a guided practice model by the teacher is an inductive method followed by learners' free practice that is elicited from the learners themselves through individual work, pair work and group work. 4- Activities are shown in individual work, pair work and group work to enable the learners to become true participants, partners and involved in the process of presentation. The teacher monitors, supports, encourages and checks. He plays the role of the orchestra leader. 5- Audio aids, visual aids, the use of realia or real things, acting, miming, demonstration, dramatization, exploration and the use of technology like the overhead projector, the cassette, the video, data show and the computer power point program, are used positively. 6- Debates, discussion, reports, researches , consults, interaction, participation, experimenting, imitation, interaction, interviewing, self- expression and passing knowledge to others illustrate the active teaching and learning inside and outside the classroom. 7- Demonstration, sharing, acting, education parties, songs, music, games, technology and transferring knowledge to others are needed. 8- The learner is self-centered in the process. He is a true partner. 9- That learning involves the senses, the brain, the behavior and the emotions of learners. 10- It encourages observation, practical learning, self-evaluation and passing knowledge to others. The child plays a passive role in the traditional technique of learning where they are encouraged to understand by just listening to the teacher. Their understanding of the subject is then ascertained only by their capability to reproduce their knowledge in exams in the form of answers to questions. This method usually relies on the rote or memorizing method where the child merely by-hearts the content in the textbooks. Activity-based learning, on the other hand, facilitates a better understanding of the subject by encouraging the child to complete the tasks at hand. The supervisor – teacher or parent, can immediately measure the child’s understanding by his ability to complete the tasks and take things ahead from there. Some theories also suggest that not every child can succeed by simply listening to material in a lecture format. This method depends on teacher's talking, lecturing or dictation. The teacher is a lecturer or a dictator and the learner is just a receiver or store to be filled with the amount of the information that he receives from his teacher without any share or analysis. 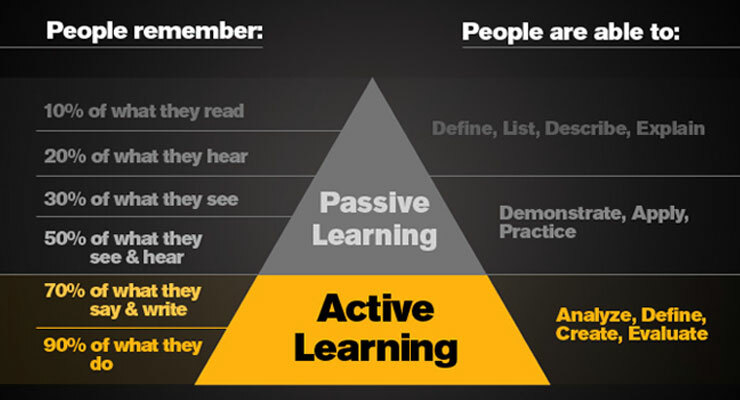 The learner's role is not basic. The process of presentation depends on just attainment not thinking or creation. It is a teacher-centered teaching. The teacher sometimes uses arranged schedules, columns and summaries so that he can attract the attention of the learners who feel bored. There is no place for pair or group work. No elicitation, interaction or participation methods are practiced. Poor few magazines or wall charts are used in the purpose of decoration and showing. The teacher uses the native language to translate the text of the target language. The teacher presents the structure as rules not as tools. We see the learners unable to give full meaningful sentences to express themselves or write a meaningful and right structured paragraph describing something in their real life. The reason is that teaching is separated from the real life of the learners. Teaching becomes dead without any real life. There is no place for technology. The only objective for the learner is to recite the piece of information to be recalled in time of the final written exams to get high marks or scores, without any real knowledge. The piece of information is forgotten as soon as the learner finishes his final written exams. 5-"Education with a good quality"